FILM REVIEW – JULIET, NAKED. 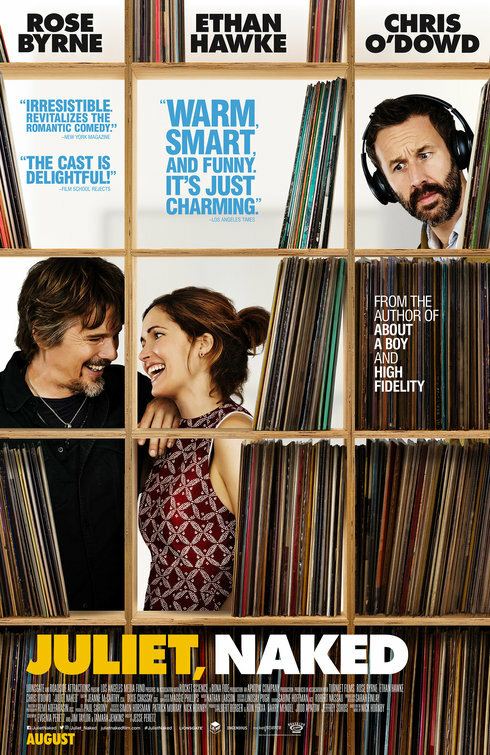 With Rose Byrne, Ethan Hawke, Chris O’Dowd, Megan Dodds, Jimmy O. Yang. Written by Evgenia Peretz, Jim Taylor and Tamara Jenkins. Directed by Jesse Peretz. Rated R for language. 105 minutes. Wanna feel old? Ethan Hawke has a heart attack and becomes a grandfather in JULIET, NAKED. Director Jesse Peretz’s semi-successful adaptation of Nick Hornby’s terrific novel soars a good deal higher than it probably should thanks to this canny bit of casting, deftly employing the star’s generational baggage to portray a scruffy, goateed ‘90s icon gone to seed, washed up and living in a barn behind his ex-wife’s house, estranged from litter of children with different mothers who all hate his guts. Reality, as it turns out, bites. Hornby’s 2009 book represented a breakthrough for its author, as he finally seemed to consider how insufferable it must be to live with a character from a Nick Hornby novel. Such is the plight of Annie (played by a pert Rose Byrne) who has spent the last fifteen years in an increasingly affection-deprived relationship with blowhard, pop-culture academic Duncan (Chris O’Dowd). He teaches a class on “The Wire” at the local community college in their sleepy little seaside town and incessantly talks about the HBO show in that way white guys tend to talk about “The Wire” that made me put off watching “The Wire” for years. But Duncan’s real obsession is Tucker Crowe. A sensitive singer-songwriter who released the devastating breakup album “Juliet” before promptly vanishing from public life more than twenty years ago, Crowe remains a cult icon to a small but intensely passionate band of fans, all of whom hang out in the comments section of a website run by Duncan. The film takes it’s title from a recently unearthed bootleg —the original acoustic demos from Mr. Crowe’s opus— of which Annie spitefully pens a bad review on Duncan’s website and attracts the attention of the reclusive artist himself. Played with pitch-perfect, dissolute charm by Hawke, the singer and Annie quickly become pen pals and then eventually something more, the awkwardness of their situation mined for some fairly large laughs as Duncan’s idol becomes his romantic rival. Peretz’s big-screen credits include the terrible 2011 comedy “Our Idiot Brother,” but he’s helmed enough episodes of “Girls” to work his way around an uncomfortable situation, with a beautifully orchestrated series of introductions in Crowe’s hospital room providing the picture’s screwball highlight. Byrne and Hawke have an appealing chemistry here, tentatively circling one another with just the right hint of wariness. As the increasing rewards of Hawke’s “Before” films with Richard Linklater have demonstrated, romances are far more compelling to watch when their subjects are old enough to have been around the block a few times and have more to lose. He’s really matured into a marvelous actor over these past several years, the callowness he carried around as a cocky youth all seemingly worried away into that fascinatingly furrowed brow. “Juliet, Naked” opened the door to a more generous, female-centric phase of Hornby’s career, including the 2014 novel “Funny Girl” and his excellent screenplays for “Brooklyn” and “Wild.” In that respect, the character of Duncan feels something like a purgation, closing the book on all the arrested man-boys and their childish obsessions with minutiae who in “Fever Pitch” and “High Fidelity” made their author a literary phenomenon. The problem is Duncan’s also a drag to be around, and Peretz and O’Dowd don’t do much to make this twit charming. You’ll wonder how he ever managed a second date with Annie, let alone fifteen years.